It is very convenient this year that Thanksgiving (for us Americans) falls on the 26th of November and that there are 26 letters in the alphabet. Do you see where I am going here? I propose a 26 letters in 26 days blogging series, going through each letter of the alphabet and describing something we are thankful for (I know cheesy) in the spirit of being thankful all November long. From the silly things to the serious I hope this will be a fun and challenging way to blog during the month of November. So anyone else want in? Maybe a good tag to go along with this? 26in26? I don’t know, I am open to suggestions for guidelines. In any event starting November 1st I will be starting off at the letter “A”, hope to see you there. Drowned in the odour of honeysuckle. This was not created by Faulkner or some piece of legislation. Just some unknown people who brought the fictional death of Quentin Compson into the real world. The sign has been stolen, replaced and photographed by many people. There is nothing extraordinary about the plaque, just a subtle blurring of the lines between the narratives we read and the narratives we live. I’m not sure what it is about this plaque I find so compelling. 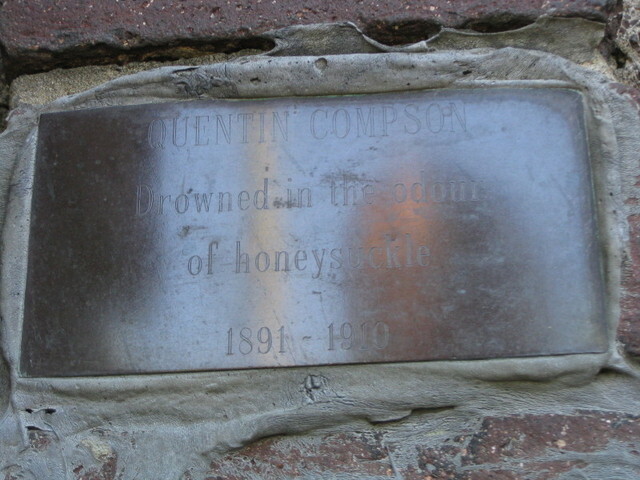 Perhaps its “graffiti” nature of the plaque, the fact it was put up by an amateur who wanted to pay homage to a fictional character; a character that so many people have studied (including myself) and have felt a connection with. A bit of the fictional world seeping into reality and leaving its mark; reminding us that the boundaries of reality are permeable and moveable.